Scotland's best known stunt cyclist has appealed for help in finding his bike after it was stolen in Glasgow. 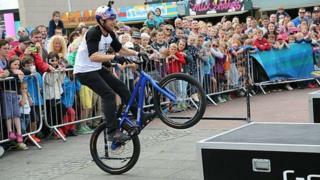 Danny MacAskill said he discovered that his blue Inspired Skye bike had been stolen from his van when he opened it at about 05:30 on Wednesday. Posting on Facebook, MacAskill asked people to "keep an eye out for it around the Glasgow area". But he advised that no-one should "go rugby tackling any kid" who was riding a bike similar to his. MacAskill said on Facebook: "Went down to my van this morning at 5.30am to grab my bike (in its red EVOC bike bag) only to find my van had been broken into and bike and bag where gone which is less than ideal!! "If you could keep an eye out for it around the Glasgow area that would be great! "Mind and don't go rugby tackling any kid riding a blue Inspired Skye off there bike! Mine have a pretty specific set up which I will post later. Cheers Danny."